Need a video & movie player with support for more file formats? Had enough of converting files from .mov/.avi format to .m4v ? (I know I sure have). Then CineXPlayer from NXP Software might be for you. 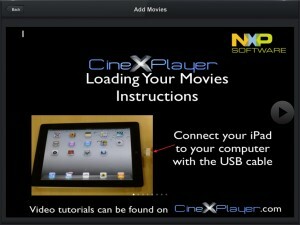 CineXPlayer is very easy to use on the iPad, one of the best things I noticed right away was it told you how to use it. 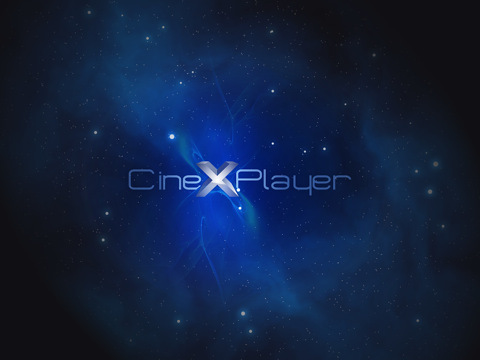 Upon loading the app, without any videos transferred over, it puts a button right in the center of the screen with instructions on how to load your movie files into CineXPlayer. A full step by step set of screenshots is included (see below). Transferring videos is very easy once you get to the App section in iTunes, just click add and select the files as any other program. Transferring is fairly quick as there is no video format conversion, although one thing that could be enhanced is a download meter to show the progress for larger files. When I first received the request CineXPlayer I thought to myself "hmmm, I don't really have a big DivX video collection", then I looked at the supported file types list and noticed the .mov file format support - which is the file format which all of my digital cameras save their movies as. I tested CineXPlayer with .mov files from Pentax Optio 555, Panasonic TZ5, Canon PowerShot SD780 & Canon Rebel T2 digital SLR. The last three all put out HD video, with the SLR running full 1920x1080 resolution video. 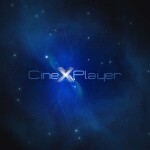 All played fine on CineXPlayer on my iPad2. If you'd like to know the difference between DivX & Xvid there is some info I found while researching this article on Wikipedia which you might find interesting. 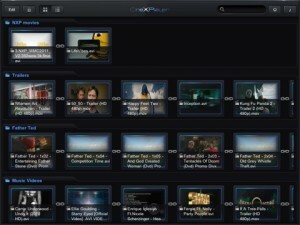 CineXPlayer is very functional and easy to use, if you're after something to play alternate video format this would be a good fit. Grab it now on iPad or get CineXPlayer for the iPhone. What do you think of CineXPlayer ? Scroll down for our comment section and let us know!